Field Fabricated Fiberglass Tanks: FRP tank manufactured terminals on site. What are Field Fabricated Fiberglass Tanks (FFFT)? Field fabrication is the best option in all instances where equipment size renders transportation impossible. Plasticon Composites has the experience and expertise to manufacture storage tanks and install them at the customers’ site in a variety of terrains and climates, with outdoor temperatures ranging from -40°C to +50°C. Plasticon Composites’ mobile plants are equipped with highly customized winding machines for the on-site manufacturing of FRP stacks, ducts, apparatus, tanks and vessels. The Field Fabricated Fiberglass Tanks are one of the latest innovations by Plasticon Composites. For decades, Plasticon Composites has been offering ‘field fabrication’ of FRP products on site, mainly for the manufacturing of FRP Ducts or Chimneys for the Power Industry. As a specialist in the design, manufacturing and installation of storage tanks, Plasticon Composites now offers: Field Fabricated Fiberglass Tanks. The mobile winding facility of Plasticon Composites is designed to manufacture complete tank farms, including tanks of different heights and diameters! Learn more about Field Fabricated Fiberglass Tanks by clicking on the icons above. What is the production time of one Field Fabricated Fiberglass Tank with a diameter of 12 meter and height of 18 meter (2,000 m3)? The production time of this type of project would be: two months after mobilization of the Plasticon Composites mobile facility at site. Depending on the diameter, wall construction, heights we can give an indication of the time. In case you do not have a specific tank design, feel free to send us a description of the medium, process, temperature and conditions. Together we can design a safe and reliable solution for your plant, feel free to request an indication for your plant. What time does the mobilization of the Plasticon Composites mobile winding facility take? It only takes one week of mobilization and one week of de-mobilization (time of transport from the storage to site depends on the location of the site). All equipment and raw materials can be transported in ISO Containers. Where and in what conditions can you manufacture Field Fabricated Fiberglass Tanks? Plasticon Composites offers the manufacturing and assembling of FFFT anywhere in the world where an industrial site is (being) build. Even in extreme climates or rugged terrains. 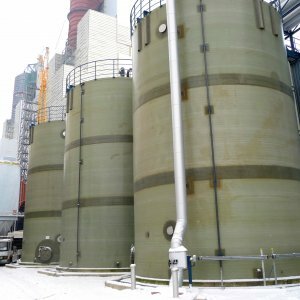 Plasticon Composites specially offers seismc designed storage tanks. We apply the ASCE 7-10 for the seismic design of the FRP storage tanks. Contact us to request for information at your location! 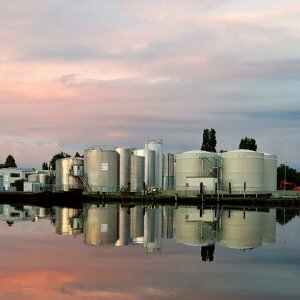 What is the maximum operational temperature for Field Fabricated Fiberglass Tanks? Depending on the type of medium, Plasticon Composites' FRP tanks can be designed for an operational temperature of 120° Celsius. Feel free to send us the specifications of the medium you handle and/or your processes. Why choose Field Fabricated Fiberglass Tanks? Click here to download the FFFT Brochure, or contact us for a hard copy. Aways feel free to contact us for any further questions. Visit the corporate home page for more information about FRP material or Dual Laminate material. Did you already make Field Fabricated Fiberglass Tanks before? For decades, Plasticon Composites already executed projects with the On Site Winding Machine (OSWM) at a variety of plants around the globe for over decades, mainly manufacturing and assembling FRP Ducts or FRP Chimneys (read more information on the Plasticon Composites corporate website). 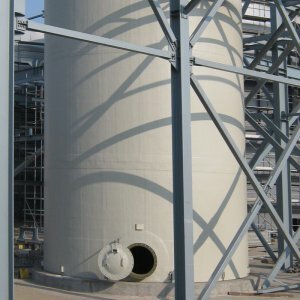 Design, manufacturing, assembly and installation of FRP and Dual Laminate process- or storage tanks is our core competence. 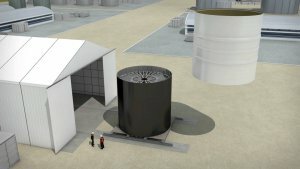 What can you store in a Field Fabricated Fiberglass Tank? All types of chemical fluids can be stored in FRP tanks, as FRP contains excellent corrosion resistant properties. Read on this page the list of mediums you can store in Field Fabricated Fiberglass Tanks and feel free to contact us for questions. Not only do we provide FFFT for Chemical and Mining industries, FFFT is very suitable for the Food Industry as well. Plasticon Composites manufactures FRP tanks in compliance with different standards from the food industry. 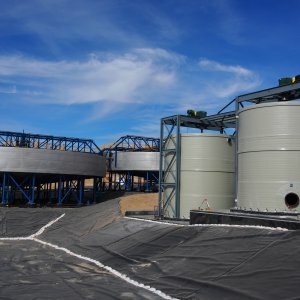 Oils in particular can be stored in FRP storage tanks, as the inner wall of a Plasticon Compoasites storage tank is 100% seamless, making it easy to clean and providing an optimum flow of the medium. High hygiene standards are met using FRP products. Contact our team to see reference projects for the food industry.